This article is simultaneously published in Foreign Policy In Focus, Online Opinion, Foreign Policy Journal, Common Dreams, Counterpunch, Eurasia Review and a number of other online journals . The first round of nuclear talks between Iran and the P5+1 countries concluded in Istanbul last weekend with a rare expression of optimism and satisfaction by both parties. The two parties characterized their talks as constructive and positive and agreed to resume their negotiations next month in Baghdad. There were several indications over the past few months that the new round of nuclear talks between Iran the P5+1 countries was going to be different than the previous talks held also in Istanbul in January 2011. The letter of Iran’s chief nuclear negotiator Saeed Jalili to his European counterpart Catherine Ashton on February 14 provided the main ground for such optimism, mainly because he refrained from using any language that would give the impression of non-negotiability of any aspect of Iran’s nuclear enrichment activities, unlike some of his previous communications. The cautious optimism expressed soon thereafter by both U.S. Secretary of State Hillary Clinton and EU Foreign Policy Chief Catherine Ashton on Jalili’s letter at their joint meeting in Washington further strengthened such expectations. To further feed into such optimism, more recently, Iranian officials also expressed hope that the new nuclear talks between Iran and the P5+1 countries would be different than the previous talks and that the scheduled meeting would mark a step forward in resolving the remaining issues between the two parties. In a rare act of public diplomacy of this sort by an Iranian political official, Iran’s foreign minister Ali Akbar Salehi published an opinion article in Washington Post two days before the nuclear negotiators were to meet in Istanbul, emphasizing the need for building mutual trust between Iran and the United States, while advising the parties to have realistic expectations of the upcoming talks between Iran and the Western powers, noting that the differences between the parties cannot be bridged overnight. While welcoming this optimistic ambience, both parties recognize that they have yet to agree on specific concrete measures aimed at building mutual confidence on a host of issues of common concern. As both chief nuclear negotiators have announced, last weekend they were able to agree on a general framework founded on reciprocity and a step-by-step approach as guiding principles of their future negotiations, while taking into account the rights and obligations of all parties under the Nuclear Non-Proliferation Treaty (NPT). Iranian officials have made it clear that the next rounds of talks should also aim at removing the unilateral Western oil and financial sanctions on Iran. While crippling unilateral economic sanctions, imposed by Western powers on Iran, have provided them with more bargaining chips vis-à-vis Iran, it should not be assumed that Iran will negotiate from a position of weakness in future talks with the West. In fact, it is a general belief among Iranian officials that Iran is in a stronger position compared to the previous talks which were held in January 2011 in Istanbul. As the head of the National Security and Foreign Policy Committee of the Iranian parliament Alaeddin Boroujerdi recently stated, Iran’s success in enriching uranium to 20 percent level and producing its own nuclear fuel for Tehran Research Reactor as well as improved internal political stability in Iran since the June 2009 disputed presidential elections have all increased Iran’s bargaining power vis-à-vis Western powers as compared to the previous round of talks in January 2011. The existing atmosphere of optimism between the two parties should not and does not obscure the fact that there are major hurdles on the path to reaching a lasting solution to Iran’s nuclear issue. It should go without saying that, like any other negotiation, setting unrealistic goals for the upcoming nuclear talks between Iran and the Western powers will kill off any chance for a compromise between the two parties. Yet, in practice determining the negotiating baseline of the other party is not always a straightforward task and the parties may end up miscalculating the capacity of the other party for compromise. There are sufficient reasons to be concerned that the Western party may be misreading Iran’s potential for compromise on its nuclear issue in the upcoming talks. 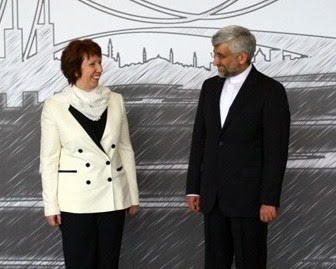 Catherine Ashton’s letter of March 6, 2012 to Saeed Jalili provided the first signs of such a possible miscalculation. While highlighting the need for confidence-building measures in the upcoming talks, Ashton wrote, “these confidence-building steps should form first elements of a phased approach which would eventually lead to a full settlement between us, involving the full implementation by Iran of UNSC and IAEA Board of Governors’ resolutions”. In this letter, Ashton sets “the full implementation of UNSC resolutions” by Iran as the ultimate goal of future nuclear talks with Iran thus ignoring the fact that Iran considers the UNSC resolutions, which call for the suspension of nuclear enrichment and other related activities by Iran, as unlawful, violating its obvious and fundamental rights under the NPT. If Ashton’s statement truly represents the baseline of the negotiating position of the Western party and is not just a negotiating tactic, it would not be far-fetched to predict the ultimate collapse of the upcoming talks. Failure to give equal weight to the concerns of the other party and to create an atmosphere of mutual respect and reciprocity is another possible scenario which may undermine the chances for a compromise between the two parties. Despite some lip service paid to the principles of mutual respect and equality, practical commitment to these principles is largely lacking in the official discourse of Western officials toward Iran. Ashton’s remarks on Iran at a press conference in Istanbul represents a general mindset among Western officials that is in part responsible for a relationship between Iran and the West plagued with mistrust, hostility and crisis over the past three decades and so . In her interview, Ashton stated that the Istanbul talks is “an important opportunity for Iran to discuss with the E3 +3 to try and find ways through our concerns about the nuclear weapons program that we believe Iran is moving towards”. “What we are here to do is to find ways in which we can build confidence between us and ways in which we can demonstrate that Iran is moving away from a nuclear weapons program" she continued. In these controversial remarks, Ashton not only took it for granted that Iran possesses a nuclear weapons program, an accusation which the IAEA has not been able to verify despite years of intensive and rigorous inspection and investigation, but also implicitly likens the negotiations to a virtual tribunal where Iran would have to answer Western concerns. One may argue that the type of language and demeanor used by Western officials toward Iran reflects the reality of material power disparity between Iran and the Western powers and that such an approach has characterized the relationships of unequal powers since the beginning of history. Yet it is simply anachronous in the 21st century to allow the language of diplomatic communications to be reduced to such realist considerations, if not for anything but for being counterproductive and creating resistance and resentment by the other party, especially if the other party happens to be a proud nation like Iran. Iran prides itself for having several thousand years of history as a civilized nation pioneering in arts, science and literature throughout much of its long history, a fact which has deeply influenced Iran’s relations with other states. There is no doubt that many Iranian officials also have a lot to learn about how to properly address Western audiences, but it is also unfortunate that after more than thirty years since the Iranian revolution, which transformed the official political culture of Iran, many Western officials have not yet developed a solid understanding of how to properly and effectively communicate with Iranian political officials. For instance, it should have been evident from very early on that any explicit or implicit display of superiority is destined to put off high Iranian political officials. A look into the statements of Iranian officials on the recent nuclear talks in Istanbul provides some fresh examples of such Iranian sensitivity to equality and justice in interstate relations. While describing the talks as constructive and positive, Iranian chief nuclear negotiator Saeed Jalili countered Ashton’s language of superiority by stating that the West should restore the trust of the Iranian nation as part of the ongoing nuclear talks between the two parties. Similarly, it helps to note that the Iranian foreign minister Ali Akbar Salehi used seven times the phrases “mutual respect” and “as equals” in his recent short opinion article in Washington Post, a fact which also demonstrates Iranian obsession with equality in interstate relations. In light of the above and given the deep roots of principles of equality and mutual respect in the post-revolutionary political culture of Iran, the success of the future nuclear talks between Iran and the West will depend in part on how far both the language and practice of Western powers toward Iran honestly reflect those principles. Please keep your comments relevant to the specific post you are commenting on! Irrelevant comments will be deleted.